Recently Arni the Indy Insider started a supplemental pool for the first Indy Pro driver not named “Alex Lloyd” to win a race this year. Arni kicked in a dollar, got Lloyd himself to kick in a dollar, and the pot has reportedly risen to all of $6. That’s six – no zeroes there, sir. One of the better bets to claim that $6 is Mike Potekhen of the upstart Apex Racing team. After achieving fair results for two of the first three races this year, the 25-year-old from Silverthorne, Colorado, asserted himself at the Freedom 100 in Indianapolis by not only qualifying 3rd but also finishing 6th after being forced to go to the back of the field due to a first lap incident with Wade Cunningham. In Milwaukee last weekend, Potekhen continued to impress by qualifying 4th and finishing in 2nd – which is kinda like winning since Alex Lloyd is pretty much running away with every race this year. Keep in mind Potekhen is racing for a team that does not have an IndyCar affiliation, so his many of his competitors have the benefits of assistance from names like Ganassi, Panther, Rahal and Andretti/Green. However, two races does not a season make, so the Apex team continues to prepare for the 11 races remaining on the schedule. Lucky for us Potekhen, who currently lives here in Arizona with his wife Nicole, took a moment to answer some My Name Is IRL questions about personal goals, racing strategy, and Boston Legal. MNII: First question, since this is so critical in competitive sports: Do you have a nickname? MP: Not really. 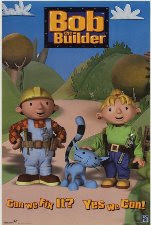 My real name is Michael so I guess Mike is my nickname. MNII: I’ve read that Apex Racing is planning for you to spend a year in the Indy Pro series before attempting to help you move up to the Indy Car series. Are those reports accurate and is teammate/team owner Ken Losch intending to move up as well? MP: I have many personal goals one of them being to drive full time in the Indy Car Series next season. 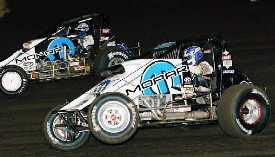 Another one of them being to win races in the Indy Pro Series. 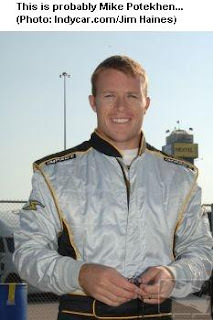 Ken has many personal goals as well and yes one of his goals is to drive in the Indy car series. As far as the team goes we will have to see where that ends up. We are growing very fast but moving up to the Indy Car Level is a huge step and commitment. MNII: Have you been studying feverishly in preparation for answering LOTS of questions about Danica Patrick? MP: Not really I just hope to race with all of the drivers in the Indy Car Series next year. I have a ton of respect for all of them anyone who can make it that far in racing has accomplished something great. MNII: Since the IPS races are 100 miles or less without pit stops, have you found the strategy to be pretty much “mash the gas and avoid Wade Cunningham” or is there more to it? MP: That is funny! I think that there is some strategy to it managing your tires for the entire race can be difficult at times. I have tried racing conservatively at the beginning of races so that I had something at the end I have also tried racing hard from the beginning. In reality there is not one way of doing lately it seams that with the inevitable yellow flag laps you have to treat these races like sprint races and go for broke every lap. MNII: You raced for a few years in the Star Mazda series against many of your IPS contemporaries like Logan Gomez, Robbie Pecorari and Ryan Justice. Who’s the toughest driver you have battled against? MP: Every driver in the series is tough to race against because of the stakes that we are all up against, being that if you do not succeed at this level your career may be over. It seems that once the helmets are on, every car on track is just another racer. MNII: Other than racing, what else are you competitively skilled at? Bowling? Poker? Sudoku? MP: I guess I enjoy working on my home as a hobby. I have a few rental properties that Nicole and I have acquired over the past few years that keep me busy when I am home. I also enjoy working out I spend about 15 hours a week in the gym. I also like to get out on my road bike for hours. MNII: You’ve still got a lot of events ahead of you this summer, but do your off-season plans involving other forms or racing or will you be back in Zambia with TRACares? MP: I would love to compete in some of the endurance races this off-season like the 24 hours of Daytona. At this point I have no plans though I do get out and run as many local Kart races as I can I feel that that is still the best training for the race season. At this point it looks like I may have an opportunity to go back over to Africa with TRACares. Our trip in March was very quick we visited so much in such a short time so I would love to go back and spend a couple of weeks. 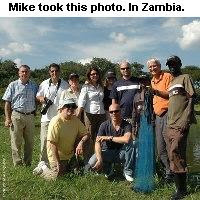 Africa is an amazing place. MNII: Very cool. 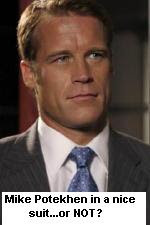 Final question: Has anyone ever pointed out to you how much you resemble Boston Legal and Keen Eddie actor Mark Valley? MP: I did have a lady at the gym the other day say that I look like him – funny you ask. My wife says that is a complement, that he is an attractive guy. I must say that Boston Legal is my favorite show. I TiVo it every week. 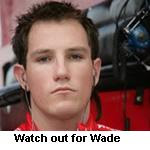 Solid driver, amazing charitable work, and he looks like an actor? Come on – someone get this man some sponsorship. Best of luck to Mr Potekhen on chasing down Lloyd, and thanks to both Mike and Jason Peters for the interview. We will be watching the races, if not any possible appearances on Boston Legal. In the meantime, we will be working on a nickname for when you reach the ICS.